It wasn’t until the Lord spoke to me about the abundant life of the olive tree that I began to understand the meaning of trusting in Him in order to live life to the fullest, continually bearing fruit… even into old age. You see… the olive tree primarily symbolizes faithfulness—an unwavering, steadfast devotion. No matter how harsh the environmental conditions may be surrounding it, the olive tree will continue to live on, producing fruit year-after-year. This scripture verse reminds us that no matter the conditions of life, we must strive to remain steadfast as the olive tree in the presence of God—remaining forever faithful and continually bearing fruit. The green olive tree in this verse not only refers to the color green but also the vigor—the health, strength and hardiness (the faithfulness) of the tree, as well as the continued abundant fruitfulness and prosperity of life. I have heard it said that it is virtually impossible to kill an olive tree; that even the smallest of root left in the ground will continue to push new shoots upward into the sky in unwavering steadfast devotion to continuing to bear fruit throughout time. Even through fire, and extreme weather conditions—in the midst of great turmoil and adversity—the olive tree will always strive to forever live an abundant and fruitful life. The olive tree stands as a reminder to us all that as we continue to steadfastly seek the Lord in every area of our lives, trusting in His mercy always, that He, being the root of our very being, will give us strength and sustenance to continue to thrive and bear fruit. Just as King David likened himself in Psalm 52 as the green olive tree in the house of God, so too, are we. David realized that the secret to living the abundant life and to continually bear fruit was in trusting in the mercy of God—his constant provider. It is because of this that My Olive Tree’s mission is to symbolically—both in the natural and in the spiritual—bring abundant life to the land and the people of Israel by planting olive trees throughout the land. 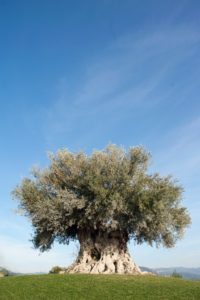 If you would like to learn more about how you can sponsor an olive tree and help bring continuous abundant life to the nation of Israel, please visit www.MyOliveTree.com .